Published: Jan 5, 2019 - Modified: Apr 17, 2019 - by Chef Rodney - Leave a Comment - This post contains Ads & Affiliate Links. There’s nothing like some good meatballs. There are so many ways to make meatballs. This time I made this Bourbon Meatball recipe I got from a friend of mine. I wasn’t sure if I would serve them as cocktail meatballs, use them in pasta or in a sandwich. 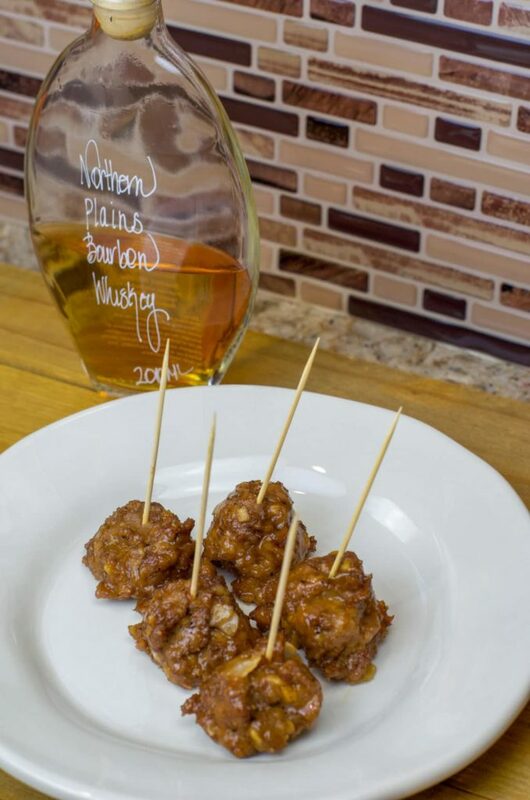 These bourbon meatballs are just superb. You should have almost all the ingredients in your pantry minus the ground beef and pork. If you don’t have any chili vinegar (very hard to find), I would suggest using Apple Cider Vinegar. I just might use a bit less than the recipe calls for. When I made this recipe, I used about half of them (per the directions below) and not only used them as an appetizer, I also decided to make some sliders with them. If I have enough meatballs left, I will use them in my next pasta dish. Please keep in mind that the Bourbon Sauce in this recipe contains alcohol. Make sure you read our notes below. While most of the alcohol will burn off during the cooking process, we cannot guarantee that this recipe will be alcohol free! Put the meatball ingredients in a large mixing bowl, breaking up the meat as you put it in. Mix together, using the tips of your fingers to gently combine everything without compacting the meal. Form into small 1 inch balls. I use a small scoop to make them nice and uniform. Transfer the meatballs to a baking sheet, and bake for about 15 minutes, until cooked through. Check with a thermometer. It should read 160 degrees. Combine all the bourbon sauce ingredients in a medium heavy pot and bring to a simmer. Simmer gently for about 10 minutes until thick. Place cooked meatballs into the sauce, and let heat through until ready to serve. Serve on a plate with toothpicks, a drizzle of sauce, and lots of napkins. Serve a bowl of sauce on the side for extra dipping. Or serve in a chafer or crockpot. → Please take into consideration that some of the alcohol may not completely burn off and the remains could be of significant concern to recovering alcoholics, parents, and others who have ethical or religious reasons for avoiding alcohol.